Natural stone has been used since time immemorial to build structures. Its durability is there for all to see from ancient monuments through to modern commercial and residential properties that sport a very distinctive look. Those looking to add to the appearance of their property while also adding to its value should consider this environmentally friendly material. Natural stone can achieve a variety of different effects to suit your personal taste and has the ability to add impressive style to your property. Natural stone is formed over thousands of years and mined from stone quarries. Due to its resilience and the durability mentioned above It is commonly used for architectural and construction projects. In terms of its unique appearance, the popularity of natural stone is added to through its crystalline textured appearance and veins of many different shades that run naturally through the stone. It goes without saying that natural stone can be used for walls, walkways, pathways, patios and drives and one particularly popular application that should not be overlooked is its use in the kitchen as worktops. Natural stone can be finished in a variety of different ways. By discussing the options available with an established stonemasonry company, you will gain a clear understanding of what finishes are available and which will best suit the effect and appearance you are looking to achieve in order to enhance your property. Natural stone restoration can be adapted using different techniques and mechanical processes and is suitable for interior as well as exterior installation. When recruiting the services of a professionally qualified stone mason you will find that natural stone fits seamlessly into almost any setting and structure ranging from contemporary through to traditional designs. One other thing to bear in mind is a long-term benefit. Using natural stone to add a completely unique look to your property will not only look beautiful, it will last a lifetime and longer. The thermal mass that natural stone offers provides natural insulation. Dependent upon the size of its structure it works to even out daily temperature fluctuations. This means that your home will remain cooler during the summer months and warmer during those cold winter spells. Regardless of whether you are looking to impress visitors (and give a pleasing effect on your own eyes each time you view your properties natural stone appearance! ), or you are looking to add re-sale value to your property natural stone work achieves both. While it cannot be denied that there is an initial investment in such a project, those taking the long-term view will certainly reap rewards. The use of this material should be considered due to its durability, environmental friendliness and the beauty it brings. The reality is that natural stone structures can add huge style to your property. Homeowners with older properties, or new occupants moving into such a property may well find old stone structures that have long been neglected. Please think long and hard before removing or destroying any old stone structure in, or on your premises. This is because there are some important reasons as to why the restoration of an old stone structure is worth the effort. You will benefit from carrying out research on exactly what period and what use your particular stone structure comes from. All will have been created for a specific reason and relate to the period of construction. Many will have been for very practical reasons, but there is always the chance that you will discover a gem of long forgotten workmanship. Of course, the internet can help in this regard, but local knowledge and a visit from a fully qualified, professional stonemason will make any discovery far more captivating. Who knows, there may well be a very interesting story behind the origins of the structure in question! The restoration of a period stone structure will increase the aesthetic appeal of your property. This could be an old fireplace and chimney breast in need of attention, an internal or external arch that has been left in a poor state, interestingly designed steps leading to the main property that are in need of attention, overgrown old stone walls or hidden pathways built from valuable stone. By restoring such a structure, you are giving a focal point to a particular area(s) of your property, and seeking the services of a professional stonemason for an impressive restoration this could well mean the structure in question becomes a talking point during family and friends’ visits. Adding charm to your property is something we should all search for, restored old stone structures can certainly achieve this. You may have no intention whatsoever of selling your property and that is completely understandable. However, the aesthetic appeal achieved through old stone structure restoration is sure to have a positive effect on its appearance. In the event you do decide to sell, this type of restoration will not only add value to your property, it could be the difference between closing the sale and missing out. It is very often the case that those on the lookout for a new home what character, they want something different. By restoring any old stone structure that is worthy of it, you will have the edge over similar properties on the market. Not only that, you should feel rightly proud of the fact that you have taken the time and effort to retain and restore a distinctive part of the property’s history. Unless you have experience with brickwork restoration you may do more harm than good. This point also relates to any old brickwork structure on your property that previous owners have tried to restore themselves. Please do not immediately dismiss it as being beyond restoration. 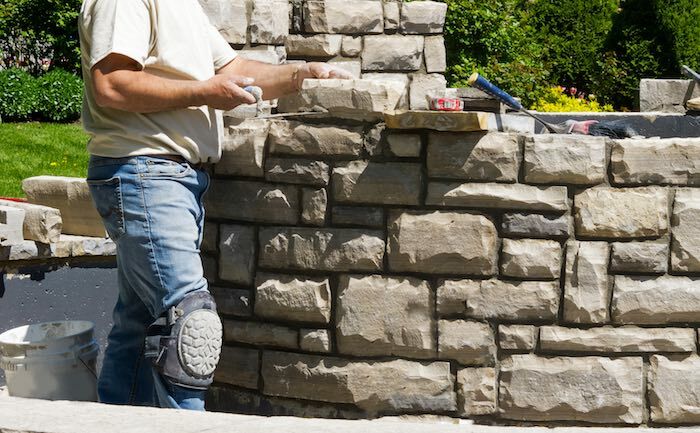 By contacting a fully qualified stonemason they will quickly advise on the state of the structure concerned and give an honest, no obligation opinion as to whether the restoration of an old stone structure is worth the effort.